A few weeks ago, Manuel Malaquias, Justine Siegwald and me travelled to London in order to attend the 20th anniversary conference of the Malacological Society of London, UK. This society is dedicated to research and education on molluscs. Although based in London (as the name refers to), the society is internationally orientated and welcomes all members interested in the scientific study of molluscs. The society was founded in 1893 and registered as a charity. One of the many activities of the society is to organize meetings and symposia, and this year it turned out to be a 20th anniversary of the molluscan forum! It was an incredible interesting day with a lot of inspirational posters and talks. 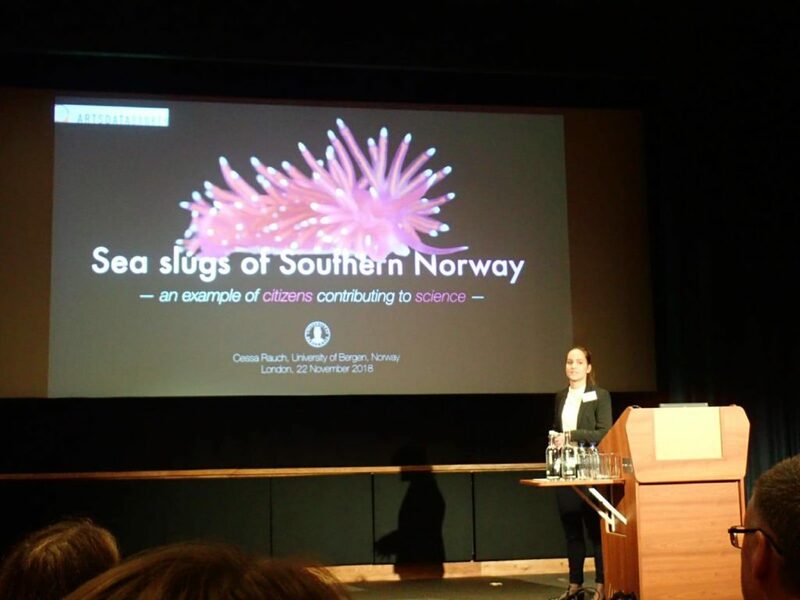 My mission for that day was to present our ‘Sea slugs of Southern Norway’ project with the emphasis on how citizen scientist made this project a success. 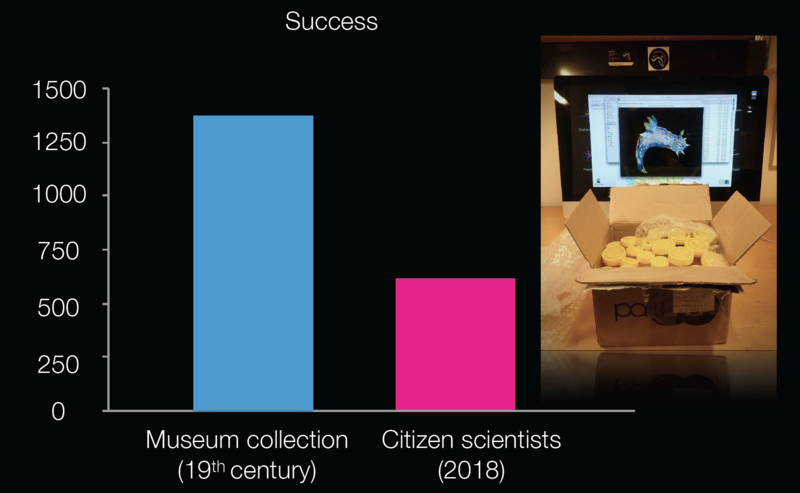 I wanted to share with the audience how citizen scientists with the right approach could be the future for many scientific studies. But first let us have a look into the meaning of citizen science. According to the Oxford English Dictionary, citizen science is scientific work undertaken by members of the general public, often in collaboration with or under the direction of professional scientists and scientific institutions. The term was first coined during the nineties in the United States of America. Since than it has grown in popularity, with multiple projects in the world that rely on the input of data generated by the general public. Some big and well-known examples are eBird, with roughly 411K users, Nasa Globe with 640K users, iNaturalist, with almost 1 million users and OPAL with 930K users and counting. Since the beginning of this year we put a lot of effort in setting up a network of volunteers and underwater photographers. We got many good people willing to contribute to our project and most them are located in the South of Norway, but we also have a few located more further up North in Norway. Currently we have around 150 members directly and indirectly involved in helping us with our project. We try to involve our citizen scientist in the project as much as possible and one way is by reaching out to them via several social media platforms. For example, in our Facebook group community members can participate in discussions about species descriptions and share their findings etc. But we also have an Instagram account that functions as a pocket field guide for followers. Besides we try to keep everyone up to date about the project by regular posting blogs. But our key element in this project definitely goes to the assembly and design of our sampling kits. These were designed specially for our citizen scientists in order to make collecting easier, more accessible and more standardized for everyone. By trying to standardize the collecting steps with so-called instructed sampling kits we minimized the errors that could occur during sampling of the data. 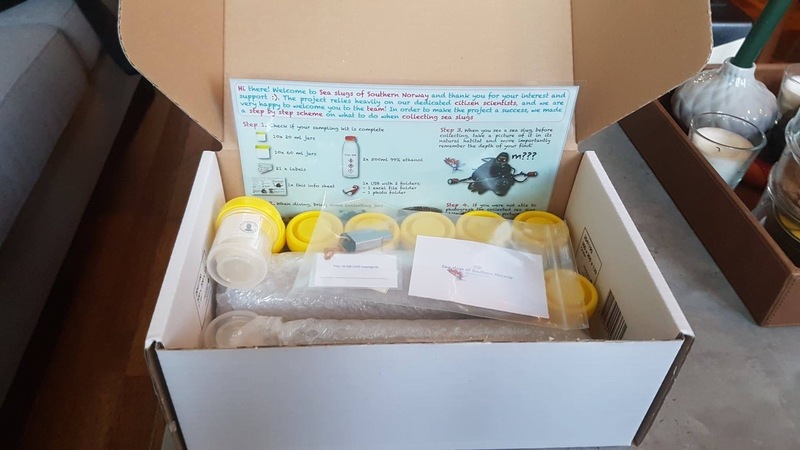 The sampling kits contain plastic jars for the samples, fixative, preprinted labels and a USB flash drive with enough space for high-resolution pictures and a preset excel file that only needs filling in. We noticed that this approach worked out and the data quantity and quality increased as well the recruitment became easier. When we look at all the Norwegian sea slug records from the museum collection since the 19th century, it consists of roughly 1400 records. 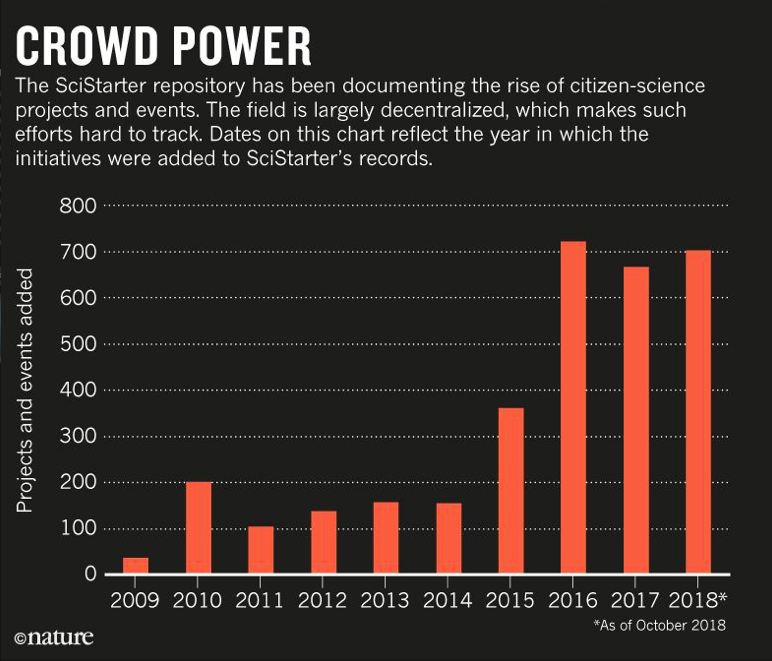 In just over six months time we see that the contribution of the citizen scientists covers almost half of that. Eubranchus farrani species complex, one species or multiple? The material that is sent in by the citizen scientists is at the moment being studied by us. We have two master students who will start working in January on a variety of taxonomic challenges by studying the different geographical material. 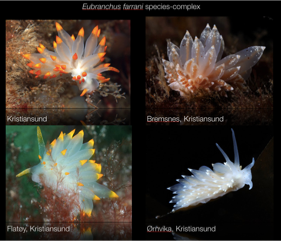 An example of this is Eubranchus farrani species complexes that have different color morphotypes from different geographical locations. Do we deal here with one species or multiple? Stay tuned for a follow up! 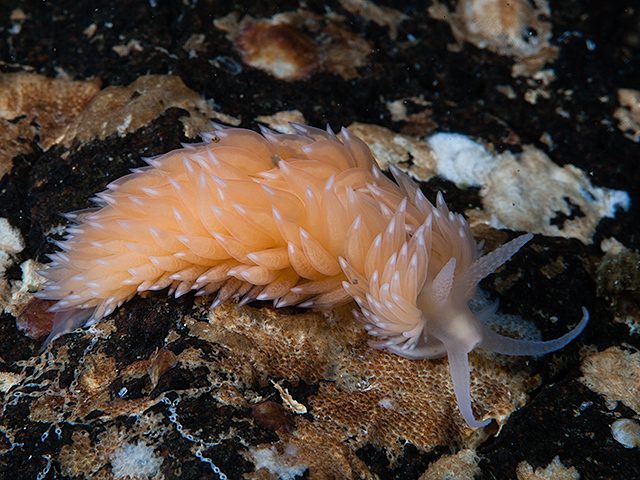 Sea slugs of Southern Norway recently got its own Instagram account! 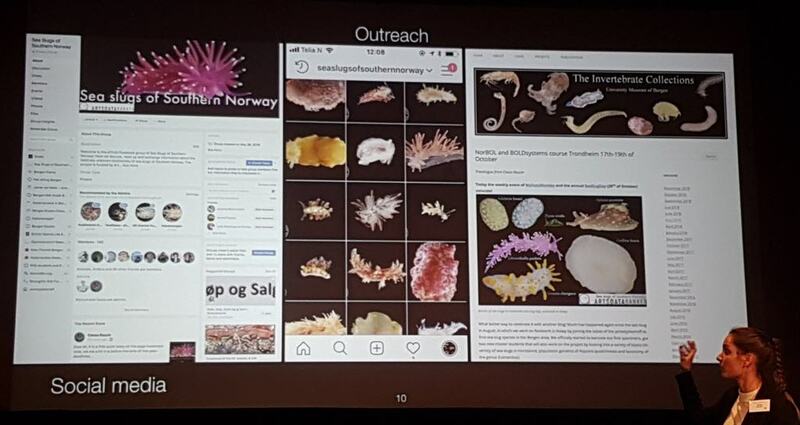 Perfect for on the go if you would like to quickly check some species, click here https://www.instagram.com/seaslugsofsouthernnorway/ and don’t forget to follow us. This entry was posted in 2018 december calendar, Conference, Current projects, Field work, Mollusca, Norwegian Taxonomy Initiative, Photography, Sea slugs of Southern Norway (SSoSN) and tagged citizen science, diving, Molluscan Forum 2018, outreach, sampling kits on December 10, 2018 by katrine. Door #15 Twinkle, twinkle, little animal? Yesterdays door of this calendar introduced the bioluminescent animals of the deep sea. In the parts of the ocean where sunlight reaches (the photic zone), production of ones own light is not common. This is because it is costly (energetically), and when the surroundings already are light, the effect is almost inexistent. An exception to this is the use of counter-illumination that some animals have: lights that when seen from underneath the animal camouflages them against the downwelling light from above. But what then with the ocean during the polar night? Last Thursdays blog told the story of the dark upper waters during the constant dark of the arctic winter, and how the quite scanty light of the moon is enough to initiate vertical mass movements. Another thing we see in the dark ocean is that processes that at other latitudes are limited to the deep sea come up nearly to the surface during the polar night. 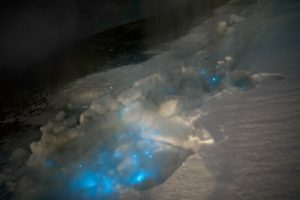 So – in the Arctic winter we don´t have to use robots and remote cameras to observe biioluminescent animals: we can often observe them using normal sport diving equipment or even from above the surface. A very recent study (Cronin et al, 2016) has measured the light from different communities in the Kongsfjord of Svalbard during the polar night. They found that going from the surface and down, dinoflagellates produced most light down to 20-40 m depth, the lighting “job” was then in general taken over by small copepods (Metridia longa). Most light was produced around 80 m depth. It is possible to recognise different species from the light they make; a combination of the wavelength, the intensity and the length of the light-production gives a quite precise “thumbprint”. If we know the possible players of the system in addition, an instrument registering light will also be able to give us information about who blinks most often, at what depths, etc. Cronin and her coauthors have made a map of the lightmakers in the Kongsfjord. This is all well and good, but the next question is of course WHY. There can be several uses for light, and we can bulk the different reasons into 3 main groups: Defense, offense and recognition. Defence has already been mentioned above: the counterillumination against downwelling light is helping an animal defend itself against predation. 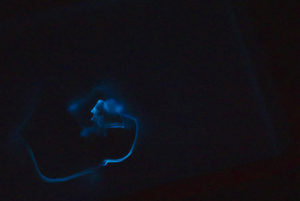 Some will leave a smokescreen, or even detach a glowing bodypart while swimming away in the dark, and others blink to startle the enemy or to inform their group-mates that an enemy is getting close. Thursdays are about amphipods in this blog, so here they come. Bioluminescent amphipods are present mainly in the hyperiid genera Scina (a Norwegian representative of this genus is Scina borealis (Sars, 1883).) Hyperiids are amphipods that swim in the free watermasses, like most other bioluminescent animals. 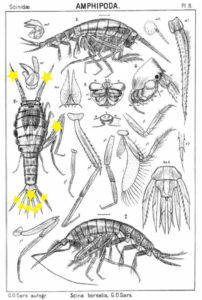 The bioluminescent amphipod Scina borealis (Sars, 1893). The added stars indicate where the bioluminescence occurs. Original figure: G.O.Sars, 1895. Crustacea use more different ways to produce bioluminescence than most other groups – this points to a possibility that the use of bioluminescence has evolved several independent times in this group. 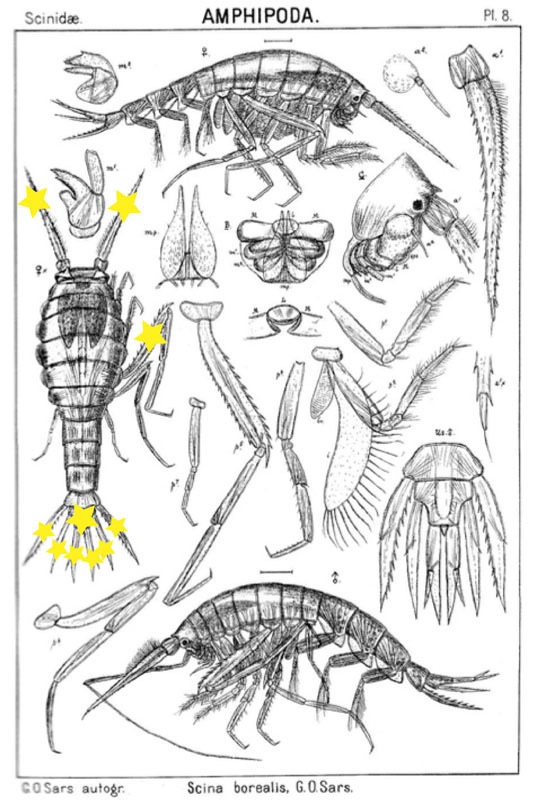 So the copepod Metridia longa will use a different chemical reaction than the krill, and the amphipods use again (several) different reactions. Some research on the bioluminescence of amphipods was undertaken already in the late 1960s, where P Herring collected several Scina species and kept them alive in tanks. There he exposed them to several luminescence-inducing chemicals and to small electrical shocks, to see where on the body light was produced and in what sort of pattern. He reported that Scina has photocytes (lightproducing cells) on the antennae, on the long 5th “walkinglegs”, and on the urosome and uropods. They would produce a nonrythmical rapid blinking for up to 10 seconds if attacked, and at the same time the animal would go rigid in a “defence-stance” with the back straight, the antennae spread out in front of the head, and the urosome stretched to the back. This definitely seems to be a defence-ligthing, maybe we should even be so bold as to say it would startle a predator? Herring PJ (1981) Studies on bioluminescent marine amphipods. Journal of the Marine biological Association of the United Kingdoms 61, 161-176. Johnsen G, Candeloro M, Berge J, Moline MA (2014) Glowing in the dark: Discriminating patterns of bioluminescence from different taxa during the Arctic polar night. Polar Biology 37, 707-713. This entry was posted in 2016 december calendar, Crustacea, NorAmph and tagged Amphipoda, arctic, bioluminescence, diving, marine invertebrates, Plankton on December 14, 2016 by pans. In 1939 the Swedish malacologist Nils Odhner described the nudibranch Berghia norvegica based on two specimens collected at Frøya and Stjørna in the mouth of the Trondheimsfjord. After its original description this species has been found very few times, the first of them by Hennig Lemche a Danish malacologist who in 1958 collected a single specimen, today housed at the Natural History Museum of Bergen (ZMBN 62033). The importance of this specimen, until recently the only one apparently available in museum collections, was demonstrated by its use in a systematics review of the genus Berghia recently completed by a team of Spanish and American researchers. The original description of Berghia norvegica is fairly detailed, but was based on preserved specimens and therefore the colouration of this species remained elusive until very recently. For over half a century nothing was known about the colouration of this beautiful and unique animal and is only in 2011 and subsequent years that Berghia norvegica is finally rediscovered by divers and researchers participating in the NudiSafaris organized at Gulen in Sogn og Fjordane just north of Bergen. 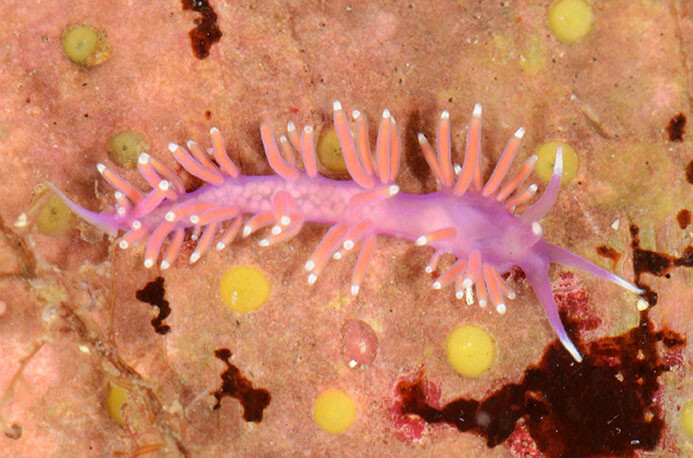 These recent discoveries revealed the extreme beauty of this delicate animal and generated the first live images of this endemic and emblematic species of the Norwegian fauna, which we here illustrate with a photograph taken at Gulen on March, the 15th of 2014 at 38 m deep and kindly made available by Kåre Telnes author of the website “The Marine Fauna and Flora of Norway”. The sea slug Berghia norvegica, an endemic species from Norway. Photo: Kåre Telnes. Carmona, L., Pola, M., Gosliner, T. M. & Cervera, J. L. 2014. 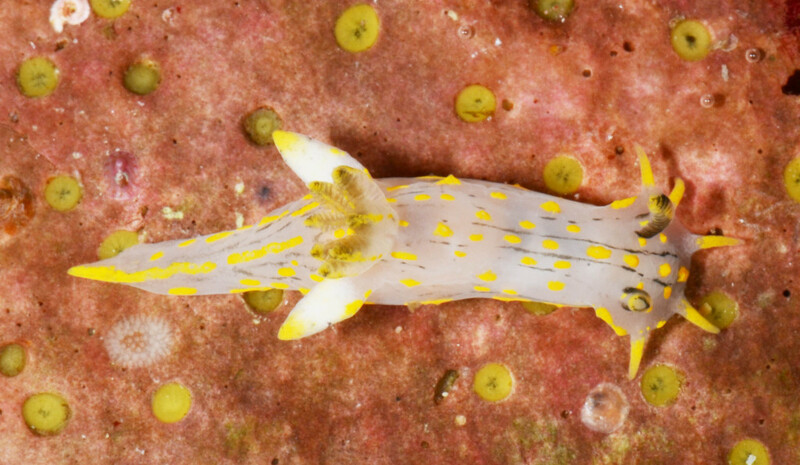 The Atlantic-Mediterranean genus Berghia Trinchese, 1877 (Nudibranchia: Aeolidiidae): taxonomic review and phylogenetic analysis. Journal of Molluscan Studies, 80: 482–498. Evertsen, J. & Bakken, T. 2013. Diversity of Norwegian sea slugs (Nudibranchia): new species to Norwegian coastal waters and new data on distribution of rare species. Fauna Norvegica, 32: 45–52. Odhner, N.H. 1939. Opisthobranchiate Mollusca from the western and northern coasts of Norway. Det Kongelige Norske Videnskabernes Selskabs Skrifter, 1: 1–93. 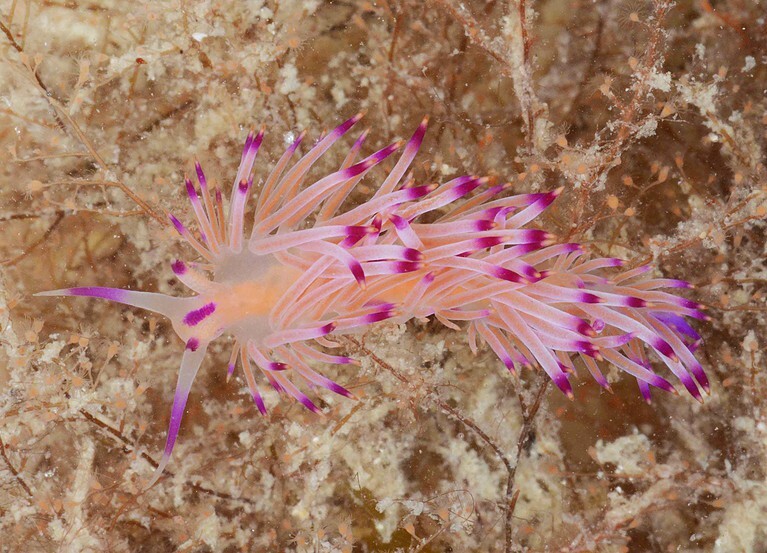 This entry was posted in 2015 december calendar, Field work, Photography and tagged Berghia norvegica, diving, Gulen, Mollusca, nudibranchs on December 21, 2015 by katrine. 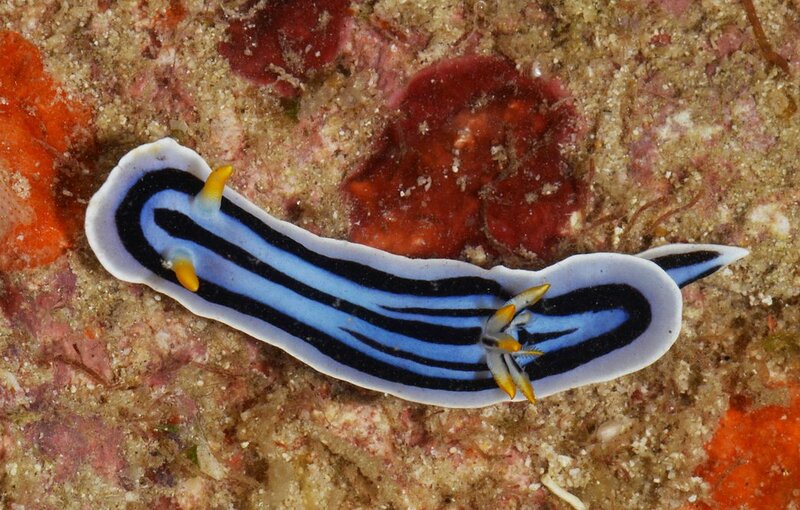 Welcome to the world of Nudibranchs! 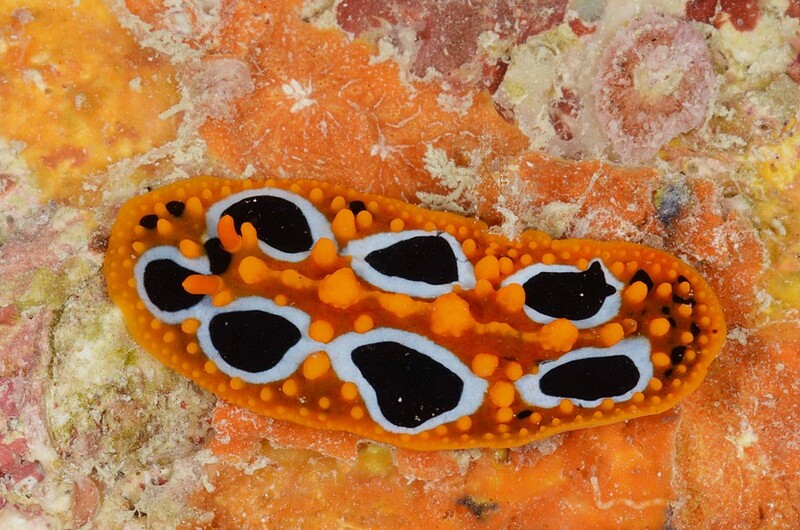 The nudibranchs are among the most beautiful animals in our seas. The palette of colours, shapes, and adaptations depicted by this group of gastropod molluscs has no parallel. Some species have no more than few millimetres where others can reach nearly half a meter. Some have a smooth skin, others are covered with long and delicate appendices. 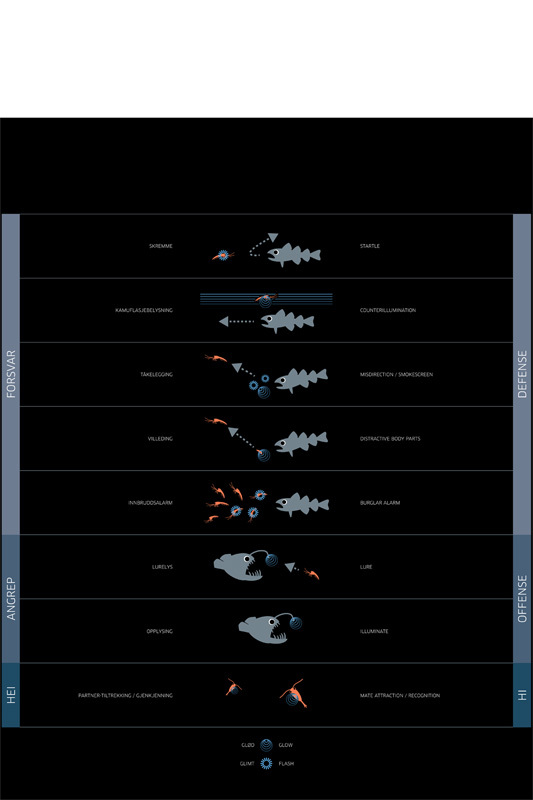 Most are benthic, but some are pelagic drifting with the oceanic currents. Nudibranchs feed on sponges, bryozoans, crustaceans, and cnidarians and even can incorporate in their tissues nematocysts sequestered from their prey which they use in self-defence. Probably, the most striking feature of these gastropods is the lack of a shell and presence of bright colours. These colours are usually a warning signal indicating the presence of deterrent chemicals some of them with pH values as low as 1 or 2. Some of these chemicals are biologically active and have been investigated for the treatment of several types of cancer diseases. This entry was posted in 2015 december calendar, Current projects, Field work, Photography and tagged diving, live photography, Mollusca, mosambik, Mosambique, nakensnegler, norge, nucibranchs on December 14, 2015 by katrine.